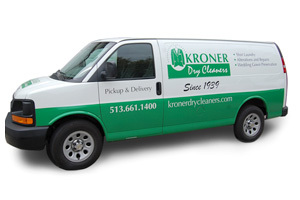 Kroner Dry Cleaners has been delivering Professional Garment Care since 1939, helping generations of satisfied customers make sure that their first impression is the best it can be. We’d love to provide that same quality of care for your valued wardrobe and offer you a 20% discount on your first dry cleaning order through January 20, 2016. Please call 513.661-1400 for details about our Pick-up and Delivery services, or stop in and visit us at 3820 North Bend Road,Cincinnati, Ohio 45211. We look forward to helping you look your best!